Jim Sauter and David Allin have been preforming music in various musical groups for over four decades! They met in Akron three years ago and began making acoustic music together. Their playlist includes favorites from Jimmy Buffet, Neil Young, John Prine and others. They also like to pepper in some well-crafted originals. Bridget will have a selection of Valentine’s day cards and other greeting cards, as well as several art prints of her original watercolor paintings. Nicole will bring her handmade jewelry and set up shop. She will have some new rhodium silver and rose gold designs as well. You can check out some of her work here! The Cave Twins is David Mayfield & Abby Rose. Identical twins separated at birth and reunited in song. David Mayfield, a Grammy & Emmy nominated artist grew up in a family band and has toured & recorded with groups like The Avett Brothers, Black Keys, & Mumford & Sons, and made numerous appearances on television including The Late Show with David Letterman & The Grand Ole Opry. Abby grew up alone. With no one to hear her cries. She eventually turned those cries into "songs" and toured extensively with Northeast Ohio supergroup "The Speedbumps" until she found out that she had a long lost twin brother. However, It's not their sordid pasts or even the chilling tale of their separation and journey to find each other that makes them special. No, it's their unique blend of playing instruments and singing words that really sets them apart. Their music has been described as "A nice mix of short cute little songs & shorter cuter littler songs" Make a point to go see them in a cave near you! Facebook Instagram Watch a Video! Come enjoy the classic wit and musical genius you've come to expect from the Flealands and their guitars, combined with the new "Land" on the keys. Their musical potpourri will put Christmas in the air for your holiday season while you enjoy a Peppermint Mocha or Gingerbread Latte! 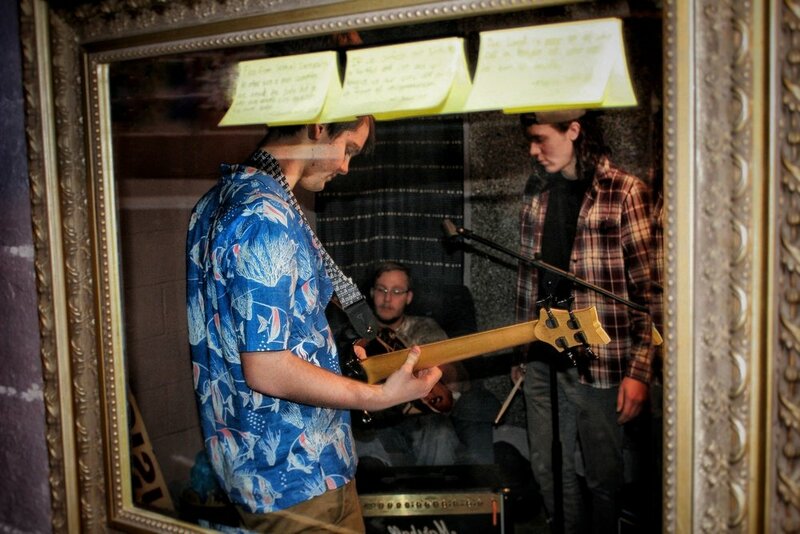 Apollo 3 is made up of three local friends who have been playing together for about a year now. The crisp vocals and folky sound are reminiscent of The Decemberists and Judah and the Lion. THERE IS HOPE IN OUR SOAP! HOPE IS HERE! WE BELIEVE IN YOU AND YOUR WELL-BEING. OUR NATURALLY HAND-MADE PRODUCTS ARE PROOF THAT A HEALTHY BODY IS THE FOUNDATION FOR BELIEVING IN YOURSELF. BODY SCRUBS, FACE MASKS, AND SOOTHING BATH BOMBS ARE JUST THE BEGINNING OF OUR GROWING COMMODITIES. IT IS OUR BELIEF THAT QUALITY IS NOT A LUXURY, BUT A VITAL NECESSITY. THE BEST PART? FOR EVERY BAR OF SOAP PURCHASED, WE DONATE A BAR OF SOAP TO THOSE IN NEED. YOU ARE ENCOURAGED YOU TO TREAT YOURSELF WITH ONE OR SEVERAL OF OUR PRODUCTS, AND SIMULTANEOUSLY TREAT SOMEONE ELSE! Kami Taylor is the designer & owner of Kami Rochelle & Co., a jewelry company dedicated to creating inspirational jewelry and other personalized gifts. Jared Lees is a jazz artist that heavily utilizes cinematic and atmospheric elements in his music. Jenny Baird is a music storyteller. Addicted to hooky, singable melodies and rich lyrics, those are the foundations Jenny strives to build on in her songs. Acoustic guitar and piano are her songs’ current best friends, but they’re not cliquey – they’re always open to some slick vocal harmonies joining the party, graciously accommodate the sometimes socially awkward glockenspiel, and are even rallying for a mandolin to join the gang. Jenny has been writing songs for 15 years, and has released a full-length album (Impossible Is Not, 2012) and two singles (Austin, 2013; Love Does Something, 2013). She is busy crafting a slew of new songs for a hopeful future album. Marielle Kraft is a 22 year old Rhode Island native with a passion for songwriting. Her honest stories take shape through catchy melodies and comfortable arrangements, while her self taught knack for guitar seamlessly compliments her smooth, natural voice. She brings new life to popular covers we all know and love through her acoustic guitar and vocal solo act. Her latest single, "How Far You Feel", is out everywhere now! Check her music out on Spotify. Strums & Drums is the duo name for Jeff & Adreanne Foos. Jeff & Adreanne are a husband and wife music duo from Warren, OH, that perform original folk music and the hits, new and old, in a folk style. Adreanne sings and plays acoustic guitar, and Jeff plays drums - for smaller venues, Jeff uses hand percussion. Lauren Brabson is a self-taught singer/songwriter from Barberton, OH. She is currently a student at Kent State University, studying pre-physical therapy. Lauren spent time singing in the school choir and church developing her passion for music and singing. In the past couple of years, she has been found performing in Wadsworth, Barberton, and Akron areas. She released an EP on SoundCloud last fall. Lauren will be performing an acoustic solo set. Derek Russell Fimbel is a folk artist from New England. In 2013 Derek founded the indie folk group The Doodads & Don’ts with whom he released two albums. When The Doodads disbanded for family reasons Derek put his focus on his own music. In 2017 he released ‘The Company You’re Keeping’, a duet album with vocalist Vanessa Hale, followed closely by his single ‘Bigger Than Me’. Jared will have a handful of knives for sale and a some more on display. I'll also be taking custom orders and doing a stone sharpening demo! Miller South School for the Visual and Performing Arts is an Akron Public School that integrates a standard core curriculum with programs in visual art, dance, theater, and vocal and instrumental music. Miller South students take daily classes in their main art interests area as well as receive top academic instruction. The arts are integrated into the curriculum and the arts integrate academics into their classes as well. Miller South accepts students through open enrollment and an audition process with a students entering grade 4-8. Starting in 2018, the music departments have started a national chapter of the Tri-M Music Honor Society. Students in band, orchestra, piano and vocal all had the opportunity to apply if eligible. These students have chosen to promote our school and new organization by performing for the community and were excited to present songs in a coffee shop setting. After researching opportunities in the Akron area, the students were all excited to collaborate with Artisan Coffee shop! Come hear what Miller South is all about as these "Modern Music Masters" stand for! ROBERT HUNTER IS AN AMERICAN SINGER-SONGWRITER, POET, AND AUTHOR OF THE HIGHLY ANTICIPATED NOVEL RELAPSE, SET FOR RELEASE IN MAY 2018. A THIRD STUDIO EFFORT REVIVAL IS SET TO DROP IN EARLY 2018. IT WAS LARGELY INSPIRED BY HIS WIFE, BECKY, WHO INSISTED UPON ITS RELEASE, AS WELL AS THE PUBLICATION OF RELAPSE, IN SPITE OF HER BATTLE WITH AN AGGRESSIVE FORM OF CANCER. Check out Robert's music on Spotify! Meet Nashville-based artist, songwriter and musician, Eleni Naomi. A captivating vocalist, she began singing at the young age of 4. Her sultry voice beckons listeners to a simpler time as they experience the style she calls, Soul Jazz · A timeless sound with a voice of hope. Eleni recently recorded her debut album with award-winning producer, Loren Johnson, and released a music video for fan-favorite, “Summer Don’t Leave Me.” This exceptional project · Still I Wait · is now available everywhere that music is streamed and sold online: www.eleninaomi.com/buy-the-album. Check out Eleni's music on Spotify! Dustin performs mostly original music with just his voice and his acoustic guitar. His style is calming, yet sensitive, and singing of conviction, doubts, faith, and the love of God. It’s a mixture of indie folk and gospel. The Painted Pebble, by Dottie, offers original designs. These include hand burned and painted wood slices as well as pebbles as ornaments, coasters and magnets. Chloe is an 18 year old student and will be playing some holiday music, originals as well as covers of many different genres of music. Kyler Morrison is a local country/folk artist who writes and sings fun original songs with catchy hooks. After a two year break from the studio, Kyler has been writing new songs and fixin' to start tracking a new album this fall! Come out an hear the new sound of Kyler Morrison! Bring your friends and have a good time!